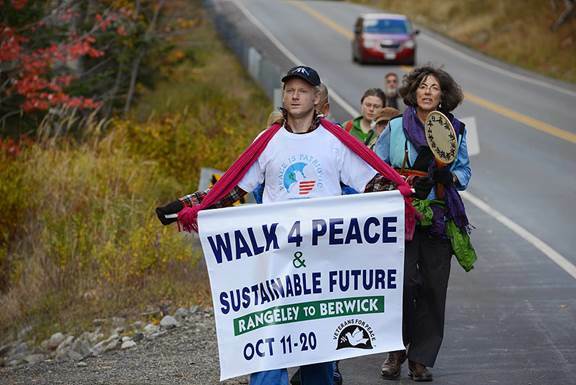 Jason Rawn leading the Maine Walk for Peace & a Sustainable Future in 2014. Photo by Peter Woodruff. I now realize that 7,000-plus U.S. nuclear weapons and 800-plus U.S. war bases, on foreign soil, aren’t enough to keep the Homeland safe against “resurgent Russia and saber-rattling China” – even though those 800-plus bases aggressively surround Russia and China. What a relief that $5.5 billion in new warships might keep us safe! And what a perfect opportunity to discuss war profiteers General Dynamics Corp., owners of world-class metal fabrication facility Bath Iron Works. A lucrative form of organized crime, war profiteering benefits the financial and political elite at the expense of the majority of us. This past year, U.S. elites mis-invested well over $600 billion of our common wealth – by some calculations, over $1 trillion – in war. I’m one of the “Zumwalt 12,” who were successfully arrested last June 18 during a nonviolent civil resistance action in which we briefly “obstructed the public way” (a Class E misdemeanor punishable by up to six months in jail and/or a $2,000 fine) at the “christening” of the USS Michael Monsoor, the second $4 billion Zumwalt stealth destroyer built by BIW. Our trial will be at Sagadahoc County Superior Court in Bath from Feb. 1 to 3. We are veterans, artists, architects, teachers. Regular people who understand and behave as if the way things are is not the way things have to be. The way things are is not the way things have to be. Jason Rawn in an alternate persona at the Womens March in Augusta last weekend.